Dear something precious I understand you have the most tiny baby burial clothes for babies born preterm but do you have caskets for a family mum had a miscarriage at 20 weeks? Something Precious introduced tiny baby caskets in 2018 for very preterm baby losses. So what is a casket ? there are 3 types of caskets for a baby funeral at Something Precious. 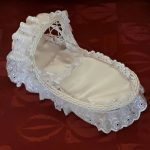 a coffin or burial casket that baby can settle in and buried in the ground in a family burial plot, or for early miscarriages in a garden urn, (at the moment in the UK only babies that have completed 24 weeks of pregnancy have to have a funeral by law under this age and parents can decide what happens to baby’s remains either buried or privately cremated or asking the hospital to arrange a communal funeral with other babies). a cremation casket that baby lies in and is put through the cremation process at the crematorium. a cremation ashes remains casket keepsake for parents to put baby’s ashes in after in internment to keep at home or scatter at a later date. at Something Precious there is also a cremation scattering ashes urn ,a smaller container usually biodegradable to bury ashes remains in or scatter at a favourite spot such as the seaside or a walk through the woods. 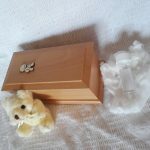 what size ashes casket to you need for a baby miscarriage at 20 weeks ? depending if baby has a cremation service at a local crematorium they state due to bone structure of the baby at this many weeks gestation there isn’t much or no ashes remains left for the parents to keep. if the family had there own private cremation and put a teddy bear in with it or other precious consumable item then in this instance there could be enough ashes to be kept as a keep sake for the family. Something precious do different size caskets depending on the age of the fetus / baby and can be found on their website quite easily under the caskets urns and coffins section. 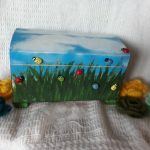 a search on the internet and you find huge size caskets which are way to big for early baby losses, at Something Precious all of the hand painted urns and caskets are made over a few weeks due to the amount of detail that goes into making them child appropriate. Something Precious ashes caskets also have snuggly bedding to lay the ashes on inside the casket, giving baby the dignity and respect they so very well deserve.no other business offers this service for babies. what gestational age in pregnancy do Something Precious offer miscarriage caskets for ? miscarriage 0-12 weeks, 12-20 weeks gestation mid term miscarriage, late miscarriage 20-24 weeks gestation, stillborn baby caskets 25-30 weeks and newborn 30 weeks – 12lb in weight. Something precious offer caskets for babies made from the following products , wood, tin, and biodegradable card. 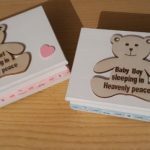 something precious caskets also offer the following child theme caskets for stillborn babies and babies born sleeping due to miscarriage … cartoon, in the meadow, teddy bear, butterfly ,ladybirds.